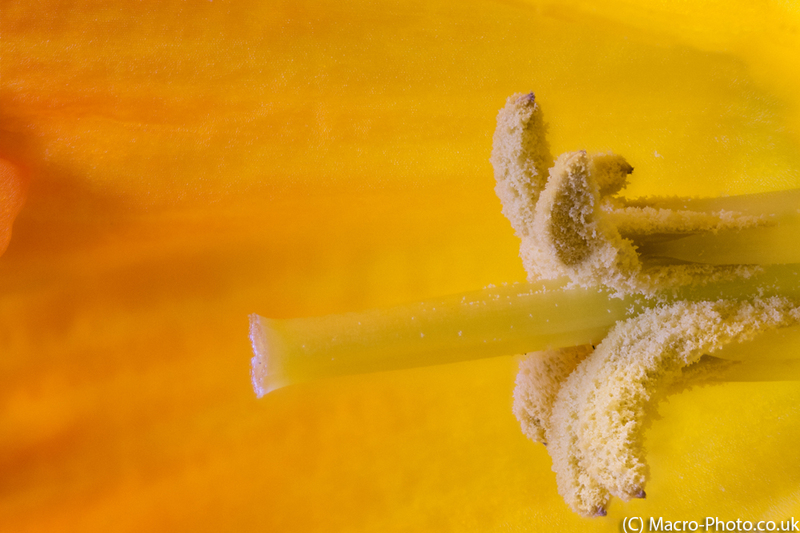 I recently had a go at focus stacking the stamen of a Daffodil, using Helicon 6. I cut half the flower away so I could see inside at the stamen. I took the shots using my new Stackshot macro rail, with the MPE-65 at F5 at 0.5 secs. This was done indoors and I lit the daffodil with my Neon Lights (Apurture Amaran AL-198C). After shooting hopefully from front to back I processed the images to jpegs, and picked the shots to use. In the end I chose 97 of the images I took ( just over 100 ). The final results after a quick clean and small crop in Photoshop was fairly pleasing for an early attempt using this new setup. Daffodil Stamen 97 Image Stack. Taken on Canon 650D with Canon MPE-65mm, using Stackshot. 97 images at 0.5 sec F5 stacked in Helicon Focus 6.